Thanks to everyone that attended last night's meeting and for giving me the opportunity to show you more about the Conservatives Of The Upstate website. • Your comments will generate better search results for the site. If it appears to search engines that people are participating rather than just clicking on a link - this website will become more visible. • Commenting is easy - just click on the word "comments" at the bottom of each article. • If you have a suggestion or something you'd like to share, you have my email address or you can leave it as a comment and I will edit and moderate it to the front page after approval. 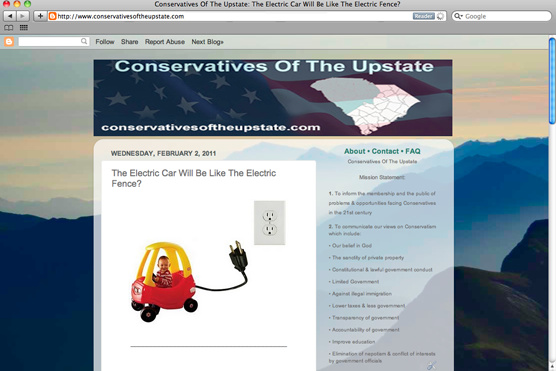 • If you buy ANYTHING online - consider searching for it first here on conservativesoftheupstate.com - this kicks back around 7% back to me. I don't think I've ever found AMAZON to not have the lowest price on books, music, DVDs, electronics, computers, and even some groceries! It costs you nothing extra to do this other than a brief visit to the website. The AMAZON search box is located on the right of every page! • If you ever have any questions about the website ... feel free to ask! I will be placing a lot of the information that was received last night on the site over the course of the next week ... I'll put it in pictoral form to help protect the privacy of the names listed. Thank you for your support! See you at our next get together!